The Kid Classic Sippy 12oz water bottle was designed for kids 3 years and older. Lightweight single wall design and small form is easy for little hands to hold. Klean Coat™ powder coat finish is 4X more durable, chip-resistant and safe for people and planet. Producing the safest most environmentally friendly products we possibly can is our top priority. Includes the spill proof Sippy Cap. Introducing Klean Coat: A chip-resistant, durable finish that is designed with care to stand up to your inspired life. 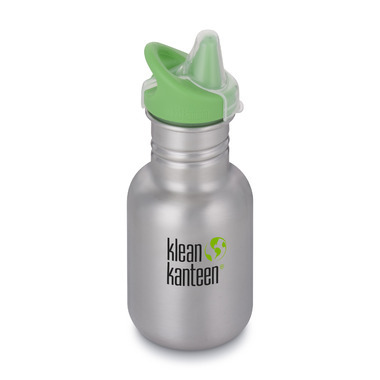 A new standard in durability and safety for people and planet, Klean Kanteen has gone above and beyond the typical safety standards when they developed this new finish. Like the product, not so much the packaging. The label is attached with a strip of glue that I cannot wash off. I'm going to have to buy some kind of heavier duty solvent (goo gone or something) to remove it, as I don't want my baby putting glue in her mouth. (She is one, so all parts of the bottle, not just the sippy part, end up in her mouth.) So for now it is just sitting on the shelf waiting for me to find time to do this. It's a little frustrating. Love the cap on this bottle! My 1& 3 yr old can use this in their own easily. Love these non plastic water bottle options for my kids (1&3years). This top is easy for both of them to use. No leaks. No complaints.